Actually Xmas is not objectionable. The letter X is a generally accepted abbreviation for the word "Christ", and has been since Roman times. It has to do with the cruciform shape of the letter. Of course the moron copy editor doesn't know this, and thinks he's just saving space, so you're probably right anyway. In Greek, the title Christ (Christos, the annointed) is written "ΧΡΙΣΤΟΣ". It will be remembered that Constantine saw the first two letters, XP, chi-ro, in the sky, along with the words "In this sign, conquer". Medieval religious manuscripts very frequently use the "Ch" symbol, "X" as shorthand for "Christ", as in Xtian and Xtianity. However, if the Daily Xpress is going to claim that writing "B.C.E" and "B.P" in dates; and (for that matter) writing "Seasons Greetings" on your Xmas cards is part of plot by Evil Pakistanis From Hell to stamp out white culture, then I might reasonably xpect them to write "Christ" on their front page. If they are going to be xtreme right bigots, at least they should be consistent xteme right wing bigots. As I said in response to the RPG net post - You should read the Daily Mail, they are shockingly bad too. 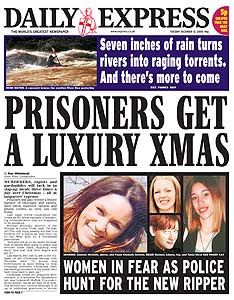 I'm suprised prisoners get a luxury christmas though - aren't they all supposed to be the evil non-xmas types in prison? But this is expresworld, where no criminals are ever caught, yet prisons are luxury hotels with hot and cold running drugs paid for by tax payers money, which Tony Blair regularly visits to snort cocaine off single mother's breasts while urinating on pictures of Jesus, Diana and the bank of England. ... Must stop reading Mr Eugenides. My god, i'm a genius. Since all prisons are luxury hotels, and all travel inns are grim reminders of being 100's of miles from home, why don't we put prisoners in travel inns and all the business types can mingle together in nice prisons? and i'll see you "express world" and raise you "mail world". Personally I like the real world - I can see crimbo decorations a plenty here, and I believe my chance of being a victim of crime is extremely low. It's like only Jews being allowed to make Jewish jokes. Since the Express is staffed exculsively by devout protectors of the Christian faith, they can abuse Christian symbols and labels in a sympathetic and self-deprecatory way without giving offense. However, since the rest of the country is filled with dirty foreigners, for anyone else to do the same thing would be a brutal attack on Christendom. Thought he were just saving space. But not face. Obviously.